This month we tested a beta version of D-Link 504 DSL Router. This router is aimed squarely at the small and medium sized office market segment. This is a nice well designed router, nice small profile, very modern looking (doesn't look like a Fisher-Price toy like the Linksys BEFSR41) but how does it compare to the more expensive Cisco 827 DSL Router and the less expensive Linksys DSL/Cable Sharing routers?? Like the class leading Cisco 827, the D-Link 504 comes with a built in Alcatel Modem, so there is no need to go out and buy a DSL modem like you would have to with the Netopia R9100 and the Linksys routers. The built in Alcatel can handle the current standard of 1Meg (or 1.5 Meg) PPPoE DSL connections as well as full rate DSL of up to 8 Meg download speeds so unlike the Linksys BEFSR41 and Netopia, this router can handle all DSL connections. Like all routers in the class, they come standard running NAT, and DHCP (both of which can be turned off if you like). As well you can open ports and block IP's (just like access lists in a Cisco). Another feature of the 504 is that as well as a command line interface (if you are a Cisco fan and used to the command line interface, you will be happy because this D-Link has a nice command line interface) as well as a supposedly easy to use GUI (graphical user interface). The GUI is a great idea, and pretty standard for a router in this class. The Webramp's, Linksys's and 3Com's all come standard with a nice easy to use web based interface so even users new to configuring a router can have one up and working in no time. One poor feature, in order to save a settings change the router wants to restart, so if you want to make a few changes, you will click save, the router will restart and obvisouly you if you are connected remotely will lose connectivety.. very bad for supporting remotely. This matter is even more serious if the router doesn't reconnect immediately after it reboots.. The web interface on this D-Link was not quite as nice and helpful as the easier to use Linksys and Webramp web interfaces. The settings for your username and password were easy to find (which is almost all you need to setup a DSL router)... and there was one really nice feature with the D-Link which you won't find in a Linksys BEFSR41 or Netopia, the router actually reports the line speed which is great (Cisco 827 also does this). There was one flaw with the web interface that was very troubling.. We could not change the Ethernet IP of the router no matter how hard we tried.. Granted, this was a Beta version of the router so hopefuly it will be fixed in the production versions of the router. The web interface is a nice start, but the design and layout is still behind the Webramp and Linksys class leading web based interfaces, but at least they can build on it in later versions and bring it up to the Linksys's web interface standard. The good thing is that shortcomings in a web based interface are easy to overlook, once the router is configured and working properly you never need to go back and reconfigure the router. How did the router perform? Well we never had a problem with the router rebooting, reloading, dropping the connection.... BUT during our tests, the router would not come up and connect to the internet if we sent traffic from the PC to the router, pings, telnets http requests, etc... We could only bring up the session if we logged into the router and hit "connect". It is hard to beleive a router not being able to come up on the slightest bit of traffic. For a company this is a major flaw, if the line goes down and comes back up (which can happen with DSL very easily) its extremely important that the router either reconnect automatically on its own, or connect at the first sign of traffic from the LAN. I also heard a rumor that you can't telnet to a D-Link 504 from a remote system.. although I didn't get a chance to test it before we had to give the router back. Nice design, some nice features but some silly bugs that really should be ironed out in future software upgrades. With a bit more work, this could really be a good router. But for now pay the extra money and go for the Cisco 827. Performance: The 504 performed quite qell, speed was excellent and stable, except for having to initiate the connection performance was quite good. Once D-Link has a software upgrade which fixes connect on demand, I doubt I'll have a performance gripe with this router. To many little quirks and annoying features with the web based interface.. Well the web interface is a great idea... needs about 6 more months of development work to bring it up to class standards. 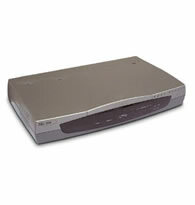 Compatibility: Well this router will work with any TCP/IP based network, 10Mbp or 100Mbps Ethernet, no problem at all. With the built in Alcatel Modem this router should be able to connect to the majority of ISP's via DSL. Features: This router has some great features, first and moremost, the built in Alcatel DSL modem is a great feature, not to mention the 5 10/100Mbps switched ports on the back. Having the router show your connection speed is a great feature to. There is a functional and useful commands line interface but unforunately the web based interface which should be a feature really needs work and this is where the D-Link 504 loses marks in this catagory. Personal: I really want to like this router, but I have to remember I had a beta test version so it hopefully the factory will put some work into fixing the evil little quirks with this router.